Six Camp Pendleton Marines are being credited with saving a man's life on their way home from a camping trip in Big Bear. 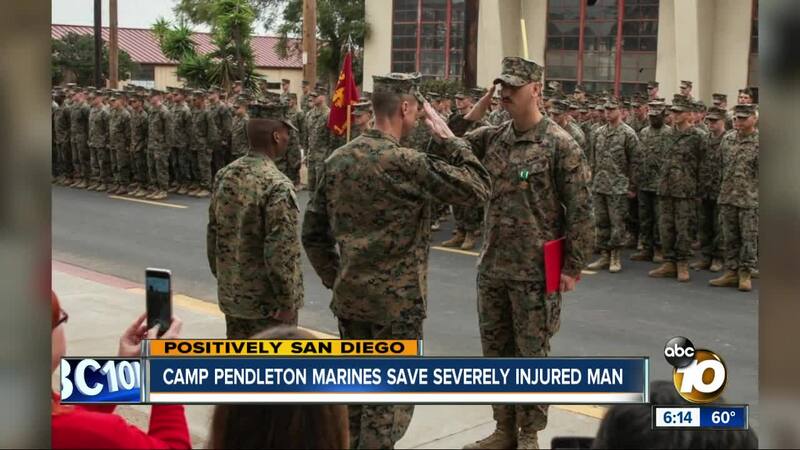 SAN DIEGO (KGTV) - Six Camp Pendleton Marines are being credited with saving a man's life on their way home from a camping trip in Big Bear. “They’ve been stationed in California for quite some time and didn’t get the California experience, so we wanted to go to Big Bear, have a guys weekend, go camping," said Sgt. Devon Espinoza, an Inventory Control Chief. There was nothing out of the ordinary about the trip until the Marines started making their way back to base and were flagged down on SR-330. “I just kind of saw the man lying on the floor and assumed he needed help, so I ran out of my Jeep and saw he was in severe shock and missing half of his right leg," said Sgt. Espinoza. A 58-year-old motorcyclist was severely injured after crashing into a guard rail; the Marines immediately went into action. One used a belt to make a tourniquet, slowing down the bleeding on the severed leg. Another Marine worked to control the crowd while Sgt. Espinoza did his best to calm the injured man. “We just kept talking to him, he was slowly coming in and out of consciousness and we were holding his hand the entire time, telling him to keep squeezing, keep squeezing. We just wanted to communicate with him, make sure that when he conscious he was telling us his name, where he was from, so that he could keep talking to us so we knew we weren't losing him," remembers Sgt. Espinoza. Eventually first responders took over. “We all just looked at each other and said did that just really happen right now?" said Espinoza. The six Marines were awarded medals for their actions, with Sgt. Espinoza receiving the Navy and Marine Corps Commendation Medal. "I was very impressed but I wasn’t surprised, these are very well-trained Marines, they applied their combat lifesaving skills and they worked together as a team which is what they do on a daily basis," said Lt. Col. Michelle Macander, Commanding Officer of the 1st Combat Engineer Battalion. Sgt. Espinoza says he was humbled to receive the recognition. "But it's even better knowing we saved a man’s life that day," he says.